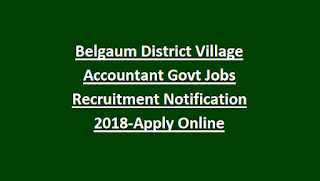 There are total 41 vacancies available for ‘Village Accountant’ post at Belgaum District Village. Candidates above 18 applying for Village Accountant Job must not exceed the upper age of 35 years as reckoned on 31-08-2018. Relaxation of 5 years in upper age is applicable for SC/ST Category candidates and 3 years for OBC Candidates. Candidates aspiring to join ‘Village Accountant’ Post must have passed 12th Class from a recognized Board. Applicants who have successfully registered for Village Accountant Post within the stipulated date will be assessed on the basis of 12th class marks. Merit list will be prepared based on 12th class marks. Merit list or short list will be updated in http://belgaum-va.kar.nic.in. 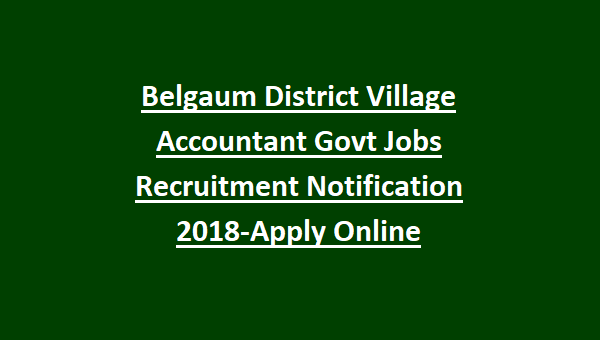 Candidates interested can apply online through the official website http://belgaum-va.kar.nic.in/ before the due date i.e. 31st August 2018.